This was what came up, and it’s quite something. 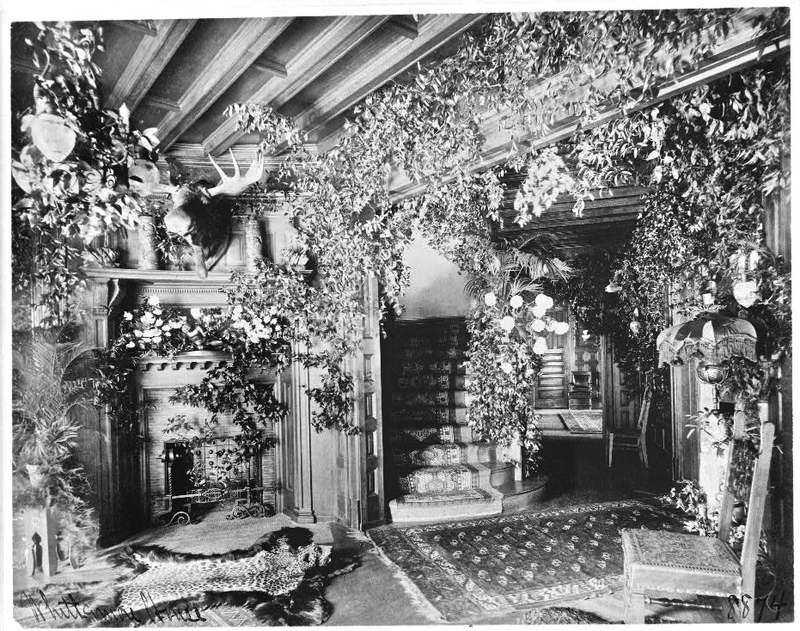 It was the interior of Whittemore House, at Dupont Circle* in Washington, D.C. Johnston took the photo sometime between 1890 and 1920. In addition to the copious foliage, it features a leopard rug and a moose head. Whittemore House was built from 1892 to 1894 for opera singer Sarah Adams Whittemore, a descendant of President John Adams. She lived there until her death in 1907. The interior in the photo may be hers, as Johnston took her portrait in 1900. Thanks to Pam at Digging for hosting Garden Bloggers’ Foliage Follow Up the 16th of every month. *1526 New Hampshire Avenue, N.W. What a fantastic image. At first sight I thought they were hops hanging, as they do in pubs in Kent and Sussex, but on closer inspection they are obviously not! But now I’m wondering what is the foliage? I can’t tell. It’s possible that it is Virginia Creeper (slightly faded) that was cut and hung up for a party. But I would like to think that it’s all a live tropical vine. Visiting from FF………..I haven’t a clue what those leaves are either – looks impressive………..though certainly OTT! That is amazing, though I do wish the photo was in color! Wow, this is amazing. Great find. Thanks! So is your blog.